Things to read whilst transiting: I love this. The Chicago Cubs have had to yank an offer that would have allowed Chicago aldermen — their equivalent to a City Council — to purchase World Series tickets at face value. Why anyone thought that passed the ethical smell test is beyond me. Then again, Chicago hasn’t always been known for its ethics…and if you’re one of the Source’s younger readers and haven not seen “The Untouchables,” go do that tonight and thank me tomorrow. Source World Series prediction: Inspired by the Cavs, the mostly unheralded Cleveland Indians — hailing from the great state of Ohio — will win their first World Series title since 1948. And they’ll win it in the friendly confines of Wrigley Field in five games. (Best Cleveland moment in history of cinema is here — warning adult language). 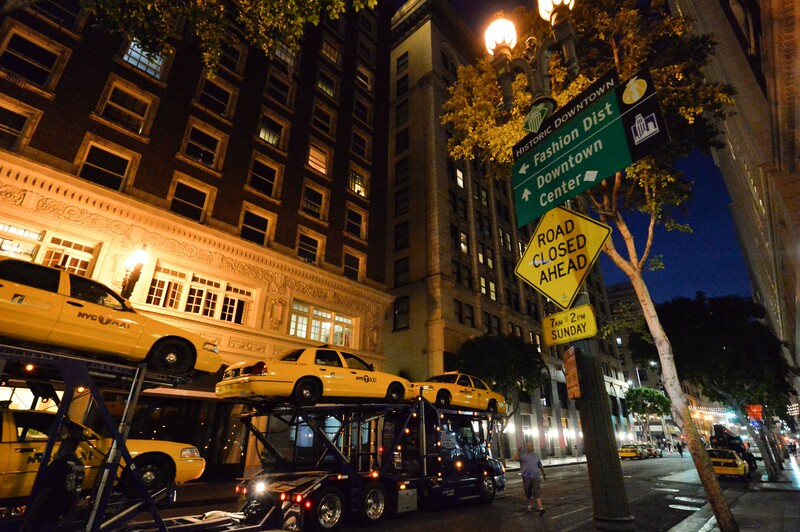 I wonder if Manhattan ever serves as L.A. for film and TV shoots. As seen on Sat night in DTLA. Photo by Steve Hymon. A good piece of local journalism on the new airport rail line in the Denver area that opened earlier this year. The project has received a fair amount of PR-love from the Denver RTD in part because it was financed partially with a public-private partnership, also known as P3. That means the RTD is basically paying a contractor to operate the line. But the line has also been bedeviled at times since it opened with delays and other on-time performance issues. As the article notes, this P3 project is being closely watched by other American transit agencies (including Metro) who are also interested in using P3s potentially to accelerate projects or get projects financed that would otherwise be lacking. Related: Metro receives unsolicited proposal that could accelerate several Measure M projects and, a second post, explaining P3s by the Office of Extraordinary Innovation. Of course, while L.A. County was infighting during those two decades, the last of the streetcars went kaput and other regions such as San Francisco and Washington D.C. got going on new heavy rail systems. Adding insult to self-inflicted injury, it’s worth noting that this was at a time when the feds were more likely to kick in grants covering a higher percentage of the cost. Right now, many people don’t have a good choice. They’re either stuck driving in traffic, assuming they own a car; or forced to navigate a half-built transit system that requires multiple transfers; or stuck biking or walking on unsafe streets that were designed for car traffic. Elon Musk — Tesla’s founder — has said a self-driving car can make it from New York to Los Angeles by the end of next year. Wired has his doubts, but ultimately concludes that Musk generally does deliver on his promises, although not always by the target dates that he promises. As I’ve said in the past, I think cars with self-driving features will almost certainly make it to market, but I’m still skeptical about many aspects of this — including safety — and wonder if self-driving cars will do all (or any) of the things their backers say they will do. As for the Cubs commentary, I haven’t seen so much sour grapes since I toured a vinegar factory.